The new BMW 4 Series. Endowed with an aesthetic appeal and dynamic flair all of its own, the BMW 4 Series has stood out with its supremely assured and stylish air ever since its launch. A total of nearly 400,000 sales worldwide (up to the end of 2016) is testimony to the tremendous allure of the BMW 4 Series, whose story began in 2013 with the arrival of the BMW 4 Series Coupe. The following year, it was joined by the BMW 4 Series Convertible and the BMW 4 Series Gran Coupe. Endowed with an aesthetic appeal and dynamic flair all of its own, the BMW 4 Series has stood out with its supremely assured and stylish air ever since its launch. A total of nearly 400,000 sales worldwide (up to the end of 2016) is testimony to the tremendous allure of the BMW 4 Series, whose story began in 2013 with the arrival of the BMW 4 Series Coupe. The following year, it was joined by the BMW 4 Series Convertible and the BMW 4 Series Gran Coupe to create a complete model family. The cars are manufactured in Munich (BMW 4 Series Coupe), Regensburg (BMW 4 Series Convertible) and Dingolfing (BMW 4 Series Gran Coupe). The new BMW 4 Series models write the next chapter in this success story with even sharper styling and revised suspension. Restyled LED headlights take the place of the outgoing cars’ xenon units. And all models in the range are equipped with LED front foglamps as standard. The LED rear lights fitted on the BMW 4 Series for the first time give extra impact to the car’s powerful looks. Modified air intakes, line-specific applications and the new rear apron add further striking touches. Moving inside, the new electroplated detailing, chrome applications and centre console in high-gloss black reinforce the exclusive, high-quality feel. Another visual highlight is the double stitching on the instrument panel, while three new upholstery colours together with three new interior trim strips provide even greater choice when it comes to personalising the interior’s design. 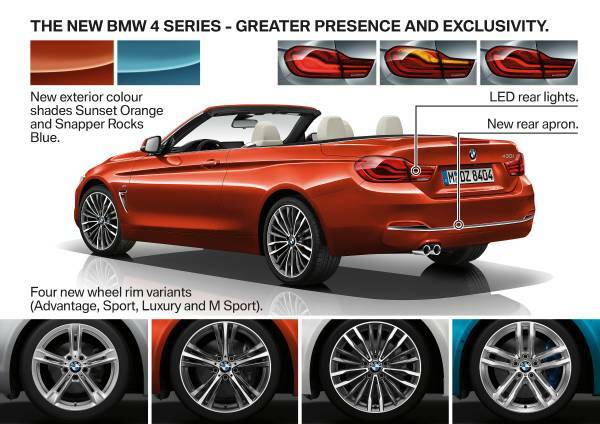 The two new exterior paint finishes Snapper Rocks Blue and Sunset Orange are available exclusively for the new BMW 4 Series models, and there is also one new model-specific wheel design each for the Advantage, Sport Line, Luxury Line and M Sport equipment lines. An abundance of additional equipment options offers ample scope for tailoring the car to individual tastes. 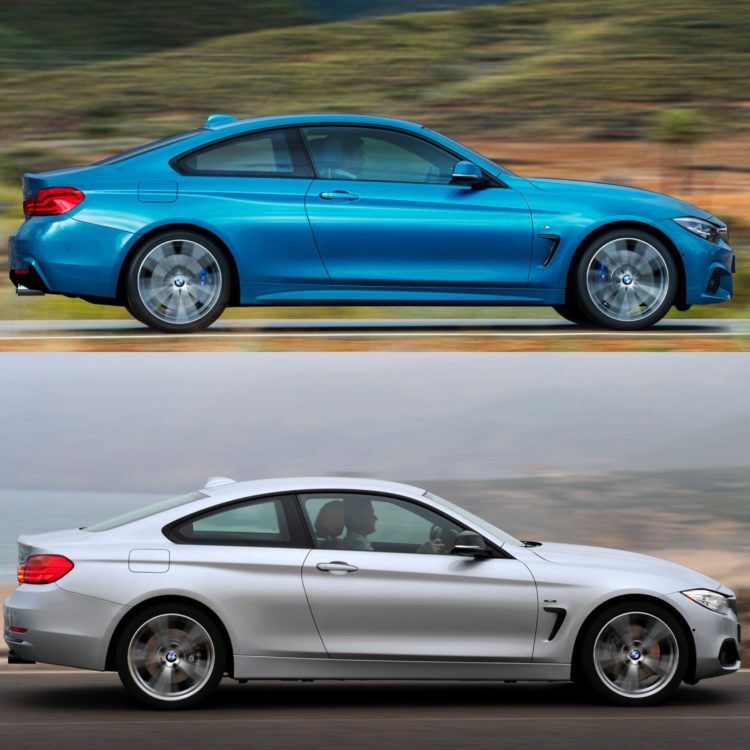 The new BMW 4 Series Coupe and BMW 4 Series Gran Coupe now come with a stiffer suspension set-up delivering even sportier handling without any loss of ride comfort. Both the lateral and longitudinal dynamics have been improved, regardless of the load on board. This applies not only to the standard suspension, but also to the M Sport suspension and the Adaptive suspension. 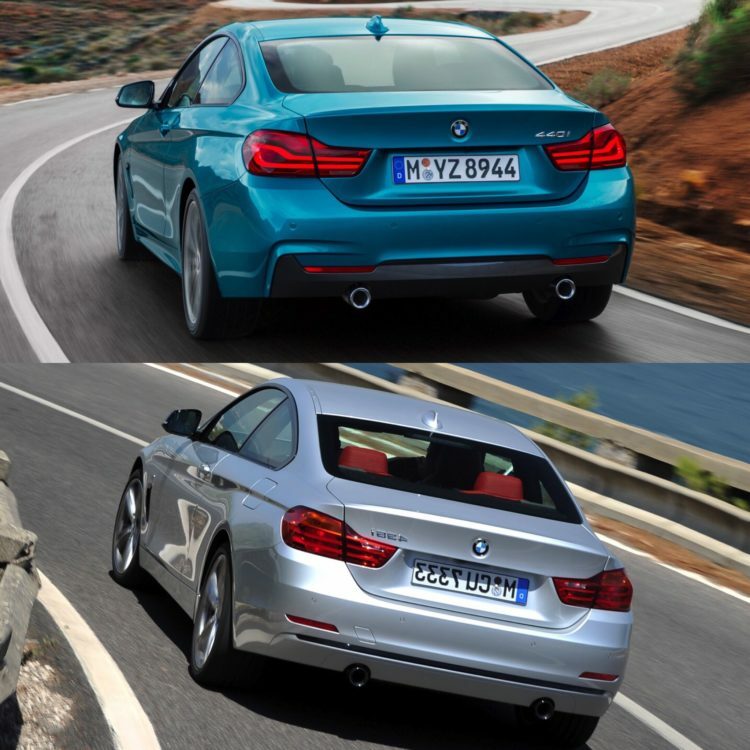 All new BMW 4 Series models now boast even more assured straight-line stability and more communicative steering. High-performance tyres are available as a factory-fitted option for all models from the BMW 430d and BMW 430i upwards. 31 model and powertrain variants. All of the petrol engines and the four-cylinder diesel units fitted in the new BMW 4 Series range stem from the latest BMW EfficientDynamics family of engines and are equipped with BMW TwinPower Turbo technology. There are three petrol engines (BMW 420i, BMW 430i and BMW 440i) and three diesel options (BMW 420d, BMW 430d, BMW 435d xDrive) available for all of the new BMW 4 Series models. 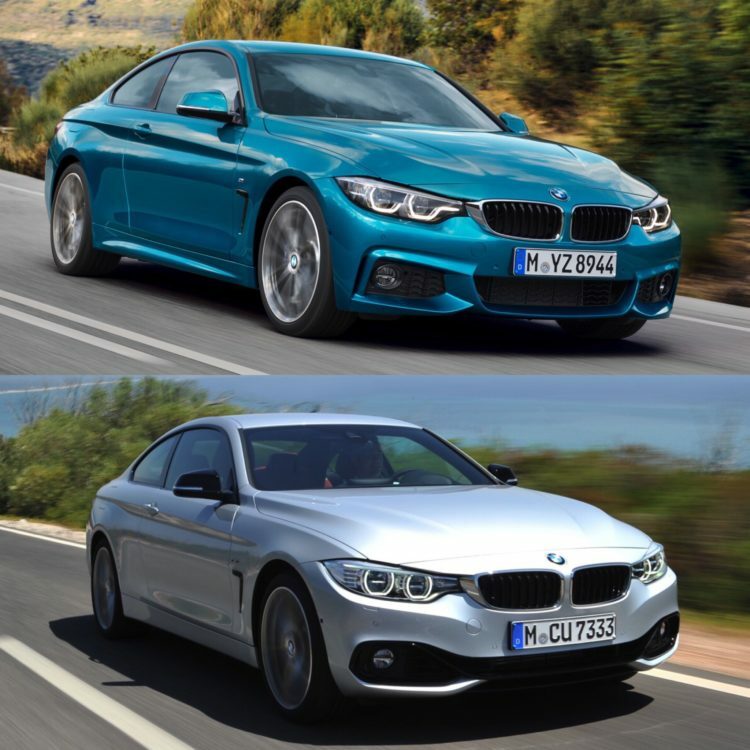 The power output of the petrol-engined BMW 4 Series model variants ranges from 135 kW / 184 hp in the BMW 420i up to 240 kW / 326 hp in the BMW 440i (fuel consumption combined: 7.9 – 5.5 l/100 km [35.8 – 51.4 mpg imp]; CO2 emissions combined: 185 – 127 g/km). When it comes to the diesel line-up, meanwhile, the power spectrum extends from 140 kW / 190 hp in the BMW 420d up to the 230 kW / 313 hp of the BMW 435d xDrive (fuel consumption combined: 5.9 – 4.0 l/100 km [47.9 – 70.6 mpg imp]; CO2 emissions combined: 155 – 106 g/km). The BMW 4 Series Gran Coupe is available in a further diesel variant – the BMW 418d with an output of 110 kW / 150 hp (fuel consumption combined: 4.5 – 4.1 l/100 km [62.8 – 68.9 mpg imp]; CO2 emissions combined: 118 – 107 g/km). A total of twelve model variants are available with the option of BMW xDrive, while the BMW 435d xDrive comes with the intelligent all-wheel-drive system as standard – in Coupe, Convertible and Gran Coupe guise. New navigation and instrumentation displays. The optional Navigation system Professional for the new BMW 4 Series now features an interface with large tile-style control pads that is even easier to use. The control pads can be arranged as desired and display a constantly updated version of the linked menu content, making operation even more intuitive for users. The BMW 4 Series range can be optionally fitted with the Multifunctional Instrument Display, giving the driver the choice of different visualisation options for all displays depending on the driving experience mode selected. Sharper design for the BMW M4, too. 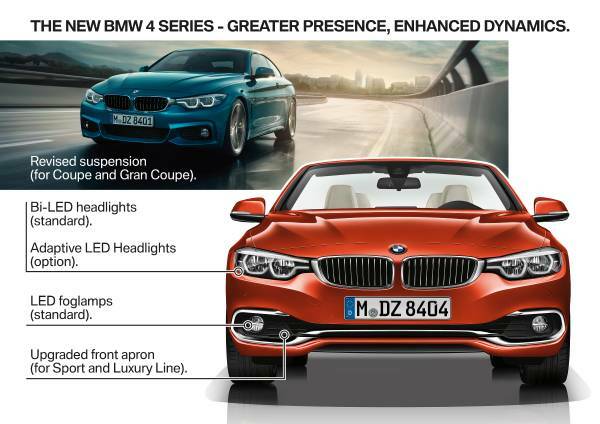 The BMW M4 Coupe and BMW M4 Convertible now come as standard with the adaptive full-LED headlights. And the newly designed full-LED rear lights again freshen up appearances and inject technical appeal. 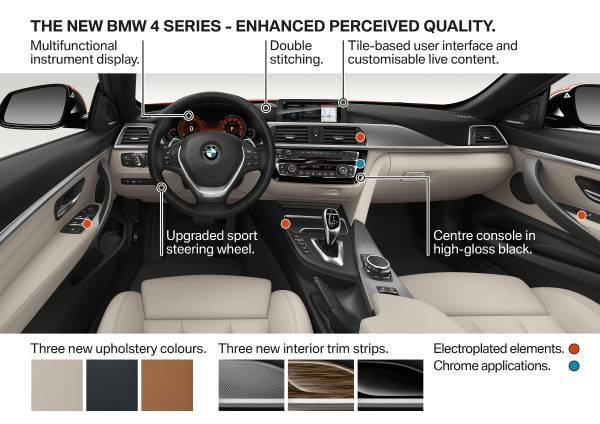 Besides this, a number of styling touches have been added to give the cabin of the sportiest BMW 4 Series variants an even more sophisticated air. And the two M4 models likewise feature the updated version of the Navigation system Professional and other ConnectedDrive features. Όλες οι ώρες είναι GMT +2. Η ώρα τώρα είναι 02:59.